When were tombs first built in the Victims of the Curse of King Tut? The myths and legends surrounding the Curse of King Tut were fuelled by sensationalized newspaper reports on the subject. Problems with the press occurred when Lord Carnarvon signed an exclusive news contract with The Times newspaper in London. This effectively forced journalists to find different ways to cover the story, in addition to copies of the original stories provided by the Times newspaper. Tomb Curses were believed to be invoked for any acts of violation and threatened any such violators with judgment in this life and in the underworld. Lord Carnarvon, who financed Howard Carter and the discovery of the Tutankhamun tomb, was the first of the victims of the the curse of King Tut. The number of victims of the Curse of King Tut varied considerably from one newspaper to the next. At one point as many as 26 people were reported as being killed due to the curse and excavation of the tomb. There were in fact 26 people who were present at the opening of the tomb, which is probably where this figure came from. 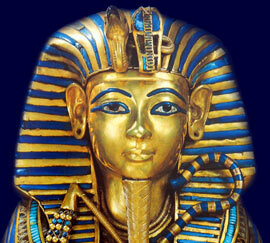 In fact, of the 26 people who were present at the opening of the tomb of King Tut only 6 died within 10 years. A total of 22 people were present at the opening of the sarcophagus of which only 2 died within 10 years. A total of 10 people were present when the mummy was unwrapped and none of these died within the next ten years. The greatest testimony against the curse is the life of Howard Carter. He spent ten years of his life exploring and cataloguing the items in the tomb, if anyone was going to suffer the threats of a curse it would have been Howard Carter. Yet he lived for another 17 years after the discovery and died of natural causes when he was 64 years old. Archaeologist Hugh Evelyn-White, who hung himself. He wrote in a letter: "I have succumbed to a curse which forces me to disappear". Until his death in 1939, Howard Carter continued to maintaining that "all sane people should dismiss such inventions [of mysterious forces called into malefic power to take vengeance on whomsoever passed the portals of Tutankhamen's tomb] with contempt..."
Each section of the King Tut website addresses all topics and provides interesting facts and information about the Golden Age of Pharaohs and of Egypt. The Sitemap provides full details of all of the information and facts provided about the fascinating subject of the Pharaoh Tutankhamun and the Victims of the Curse of King Tut.